Yesterday I took part in my second (official) fantasy football draft in nine years. The first one had been back in September of 2001. I was 16 years old and my brother John had invited me to join a fantasy football league with his friends, the draft to take place at one of their apartments in lower Manhattan. On Saturday night, September 8th, we gathered in the living room of a relatively small but nice apartment and had our draft. I was by far the youngest person in the group. We put our names in a hat and chose randomly to determine the draft order. Somehow, I ended up with the #1 pick. I took Rams running back and all-around superstar Marshall Faulk. He would end up winning the league for me that year, bringing home a pot of almost a thousand dollars. What I remember most about that evening was the drive home. As we curled around from the West Side Highway to the Battery Tunnel entrance, I stared upwards out the window at the enormous gold-lit glistening towers that hovered above. My grandfather started his own business, a customs brokerage firm, at the old Alexander Hamilton U.S. 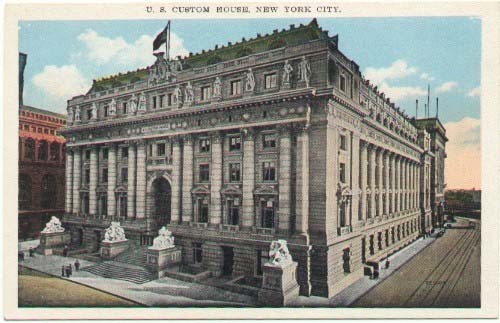 Custom House back in 1968. The same building is now the National Museum of the American Indian. 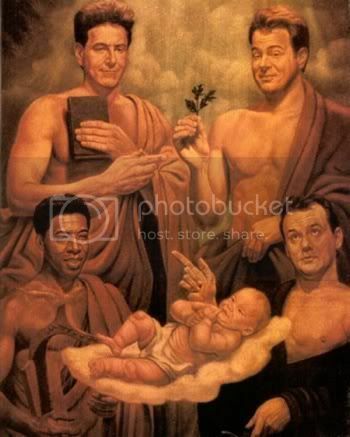 I remember it most for its role in Ghostbusters 2 where the ghostbusting crew defeated the terrible ghost Vigo the Carpathian. Vigo was a ghost from the 17th Century trapped inside of a menacing-looking painting. That movie came out when I was 4 years old and occupied a major role in my life for years to come. Every time I would pass by that old Custom House building I'd remember how my mom and my brother John used to tell me they'd seen the camera crews filming scenes there, especially the scene where they covered the entire building with pink slime---which was in reality one big plastic bag. When construction on the Twin Towers was completed in 1972, my grandfather moved his business into an office space on the 21st floor of the North Tower. The business remained there for the next twenty years. Both my mother and my brother John took jobs with his company and I have great memories, some of my earliest memories in fact, of spending time in that office, staring out the narrow windows in my mom's office at the people on the ground who looked like ants. I perfectly remember the lunch room which had chairs like movie director chairs. My grandfather's office was mostly dark green rug and leather seats. His desk was made of dark shiny wood and it was always covered with huge stacks of papers. And I'll always remember Phil. Phil Jackson. A smooth-talking, funny, tall lanky black man, Phil was the office messenger and he always wore a baseball hat and always entertained my siblings and me whenever my mom brought us to work. When my grandfather died, he left the business to his greedy second wife and a rift split apart my family from the business. My mom and brother John (and a few other folks from the old company) started working with a new company located a bit further downtown, right on Battery Place, just a block or two away from the old U.S. Customs House building. With the new company, my mom (who held a pretty prominent managerial position) had maintained a working relationship with another business that was on the 89th floor of the North Tower. When I'd go in to work with her we would sometimes walk over to the World Trade Center and I'd get to see the amazing view from that 89th floor office. The guy in charge was Albert, a super nice man with a warm personality. Behind his desk was a large set of windows that overlooked the sprawl of Manhattan. It was absolutely stunning. Whenever I'd go up there and see that view I had chills and an experience of what I now realize was "sublime." Awe-inspiring. It was almost too much to behold. It felt as though you could reach out and touch the Empire State Building which was really about 3 miles north. During the summer that I turned 14, my mom hired me for my first job ever: messenger. My old pal Phil Jackson, who was part of the crew that had moved to this new company, showed me the ropes for about a week. My job was to take documents from the office on Battery Place and walk around downtown Manhattan bringing the documents to their destinations. One of those destinations, a daily regular, was Albert's office on the 89th floor of the World Trade Center. You had to take two elevators to get up to the 89th floor and in between there was a sky lobby with a stunning view and I'd often stare out the window for a while. Since I'd usually bring their documents around lunch time, I would really milk the time (I was working for my mom after all) and explore, hang out, go to Borders bookstore, look for new Wu-Tang cds at the Sam Goody in the underground mall, and sometimes just roam amidst the buildings. I can remember days when I'd sit in that beautiful plaza in between the towers, I'd peoplewatch and write down stories in a marble notebook. I always ate pizza at Bari's Pizza on Greenwich Street, played chess in Zuccotti Park, bought comic books from the street vendors on Church Street. It was really a beautiful time in my life and I have great memories of it. Unfortunately (maybe because I was basically being paid to roam the streets everyday) I was never hired back after that summer. But on my last day of work that summer (it was 1999), my dad came in to the city from Staten Island to meet my mom and me after work and we all went up to the observation deck atop the South Tower. Afterwards we ate pizza for dinner at Bari's. My last job before moving to San Diego was an accounting position in Piscataway, New Jersey. The exit I got off at to go to work was the same as the one for Rutgers University. At the time, Rutgers had a superstar running back leading their football team back to respectability after over a decade of losing seasons. His name was Ray Rice and in April 2008, just two months before I would leave my Piscataway job, he was selected by the Ravens in the NFL Draft. Now, Rice is one of the best running backs in the NFL and I was coveting him in my draft yesterday. I got him with my #1 pick.